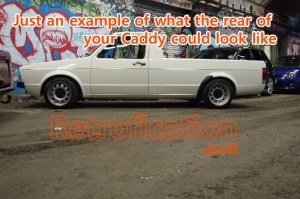 To successfully lower the rear of you Caddy you will need to relocate the axle onto the top of the leaf springs, this is commonly known as an "axle flip". If you send us your axle we will weld on brand new offset spring saddles, and a brand new compensator bracket, both are designed specifically for the axle flip. We originally designed the offset mounts to compensate for axle miss-alignment after the flip, with the offset it helps re-centralise the wheels within the centre of the aches, this makes it more aesthetically pleasing and it also helps prevent tyre rub on the leading edge of the wheel arch when lowered. 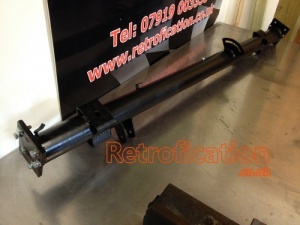 We also sell other products to complement the modified axle such as, shorter rear dampers, stub axle bolts & U-bolts. You will receive back the axle that you send us, so if it is damaged in any other way you will receive it back in the same condition, but with the axle flip mods carried out. When removing your axle it is common for the stub axle bolts to snap due to age & fatigue. Unfortunately removal of these snapped bolts is time consuming, and due to the lack of decent second-hand axles we charge £10 per bolt removal, so please choose the correct option above. If you decide to remove the bolts yourself and we feel they are miss-aligned or butchered in any way, we will modify your axle (rather than exchange) and return it back to you. These extended and adjustable spring shackles are designed to "raise" the rear suspension on your Caddy after it has been lowered.